“Ways of Being” is a workshop, led by associate professor Rodney Sharkey, and put together by Humanities faculty at Weill Cornell Medicine-Qatar (WCM-Q) for the Continuing Professional Development (CPD) wing with a view to offering healthcare practitioners in Doha increased knowledge of drama and dramatic practice. Expert faculty in the field of drama and performance, Psychiatry, and Primary care met and discussed the current status of knowledge and competence in the field of drama in Qatar. Based on this discussion a detailed questionnaire was generated and sent to potentially interested attendees from the CPD mailing list, with 64 respondents. Responses indicated wide gaps in knowledge of drama and its medical benefits at both the theoretical and practical level. So “Ways of Being,” taking place on Saturday April 6th at the WCM-Q campus in Doha, will propose that the history of stage drama provides a rich mimetic and emotional repository for the healthcare professional to mine towards establishing the type of performance knowledge that can enhance the clinical setting. Attendees from primary health care facilities, in addition to WCM-Q students, will be introduced to the history of drama and performance and the role of drama in social life. After taking the workshop, participants will be able to identify the genre characteristics of both comedy and tragedy, explain the three key features of Aristotle’s Poetics, and apply this knowledge to medical practice. After this session participants will also be able to interpret dramatic readings for catharsis value relevant to medical practice (as a result of close analysis of scenes from Shakespeare) and also able to identify unspoken emotional resonances in interpersonal communication. They will learn the last skill as a result of understanding how actors use personal experience in method acting paradigms. There will also be a physical theatre workshop during which participants will learn to distinguish between open and closed body language. In this way we will experiment with actor training with a view towards creating better patient outcomes in the clinical setting. Finally the workshop will consider the scripts, roles and performances that overlap between everyday life and medical practice, exploring whether empathy can be taught and whether developing an empathetic imagination leads to more empathetic behavior. A further blog entry will reflect on the workshop after the event. 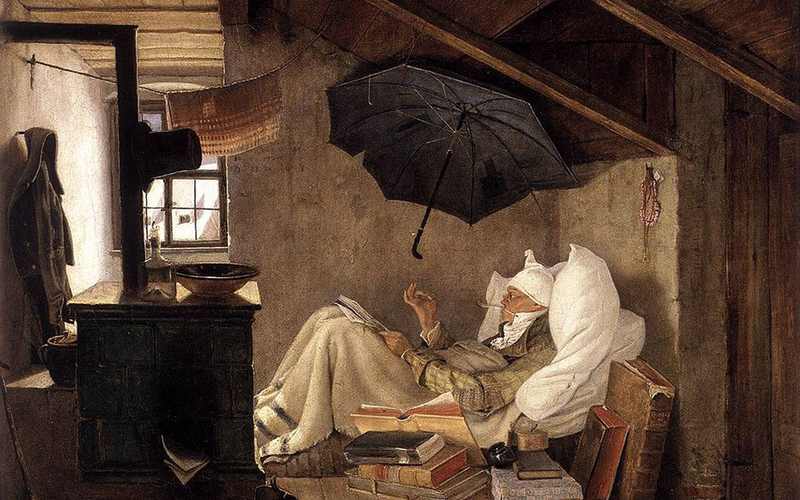 Image: Spitzweg C. The Poor Poet. Munich: Neue Pinakothek; 1839.